Remakes are a hard business, especially for any fans who are willing to take a step back and look at the originals they are based on. The release of the original 1981 Clash of the Titans on Blu-ray recently gave any willing fan a chance to see Ray Harryhausen’s film before they walk into cinemas for Louis Leterrier’s remake, and I wonder if it will affect other moviegoers the way it affected me. 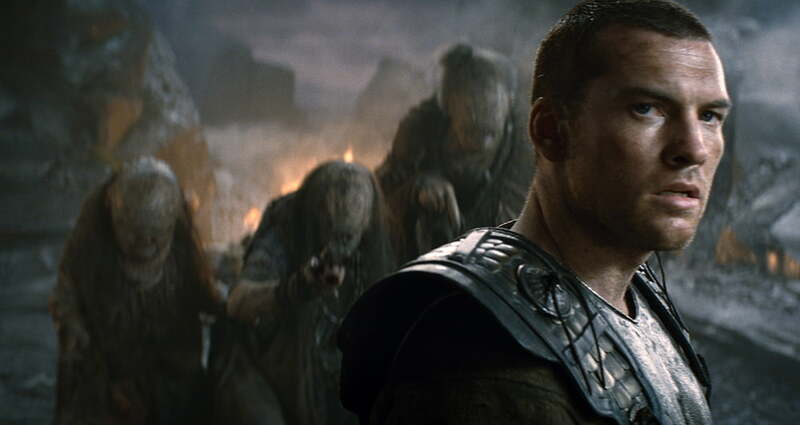 Sam Worthington stars in the new film as the mythic Perseus, the half-human son of Zeus who has been living a sheltered, normal life, unaware of his heritage until a vengeful Hades, played by Ralph Fiennes, inadvertently kills his adoptive family. Left alone, Perseus is rescued by the only survivors of the incident; a group of soldiers who initially brought down the wrath of the gods because of their own orders to destroy a statue of Zeus. Taken to the city of Argos, Perseus is once again witness to the wrath of the gods as Hades kills off a legion of soldiers and tells the king of the city that the gods are tired of their insolence. If Argos does not sacrifice their princess, Andromeda, Zeus will release the monstrous Kraken and destroy the entire city. At this point, Perseus also discovers the truth: he’s a demigod, and he might be the city’s only hope, if he can just find a way to defeat the Kraken so that dear Andromeda doesn’t have to die for her city. With a small group of tough soldiers by his side, Perseus will hunt down the creatures of legend who might be able to help him, while he discovers a bit more about himself, and his father, Zeus. Essentially, the story is unchanged from the original film. This is a hybrid of the original Greek myths that I actually think works quite well. The down side is that, although it might sound impossible, the dialogue is a notch more ridiculous than the original, and of course, the cast is but a shadow of Harryhausen’s epic, which included Laurence Olivier, Maggie Smith, and Ursula Andress. Neeson does make a decent Zeus though, even if his part is a little on the light side. Ralph Fiennes as Hades, on the other hand, is the epitome of scenery-chewing exuberance. He’s almost too manic, even though he is kind of a blast in this part. Sam Worthington, on the other side of things, is not that exciting. He’s a depressing lead with little charisma, and not nearly enough character to fill out the great role of Perseus. At the best of times, he’s merely a body to run through the action sequences, and the script is as much to blame for that as the actor himself. He’s never been a fantastic actor, but this is definitely a career low-point by my books. His co-stars are actually a lot more interesting, especially in the case of Mads Mikkelsen as Draco, Gemma Arterton as Io, and the very entertaining Liam Cunningham as Solon. Credit is also due for the special effects, which are generally quite good, especially in the battle sequences with the giant scorpions and the all-important final battle as the Kraken appears. The whole movie feels, in fact, like one giant setup for this sequence, and that’s partly why the story suffers so much – it’s all just rushing to get to the end. The gigantic failing point of the film, however, and the reason I had a hard time sitting through this version of Clash of the Titans, is the unbelievably bad 3D. Given the choice between seeing it in 3D or regular, old 2D, I might actually watch the film again in 2D. The 3D is so poorly done, it’s hard to sit through. Since the film was clearly not shot in 3D, they have worked some sort of cheap process on the film to make it appear in 3D, but the effect looks like it’s sitting on top of the 2D background. There are times when you can see the edges of the 3D images repeating over the background. It’s a bit like looking at an action figure that’s been glued to a sheet of paper, and throughout the scenes all you can focus on is that sheet of paper. In its glorious two dimensions, I might have enjoyed Clash of the Titans, but this 3D version is nothing more than a bad cash grab that looks worse than any bad effect I saw in the original claymation sequences of Harryhausen’s version. This Clash of the Titans lives up to the original in terms of revitalizing the action, but on all other points, it feels like a cheap knock-off. Nicholas Sparks’ novel about a father and daughter trying to reconnect over a summer in a Southern American beach town. Using music to bond, Steve, played by Greg Kinnear, and Ronnie, played by Miley Cyrus, slowly come together, even though Ronnie starts out wishing she could be home in New York City instead of stuck with her father. Earning poor reviews across the board, critics don’t have a lot of good things to say about Julie Ann Robinson’s summer teen movie, but Jen Yamato of Movies.com had some small praise.